As ever my technical skills do not extend to posting photos on here of the display. We were fortunate that the Quality Hotel in Clonakilty were very accommodating and provided us with a fully lit revolving turntable cabinet normally used for cake displays in their cafe. At almost 6 feet tall with 5 glass shelves it has proved ideal for the job and a fitting setting to display the hard work done by so many and in particular Brian Webster. With glass on all 4 sides I have the happy complaint that i have nowhere to properly display the various championship stickers or the little page I did setting out the background - I will copy that on here later. The display was well received last evening and all i can say for now is that you will all get a chance to see it in due course. 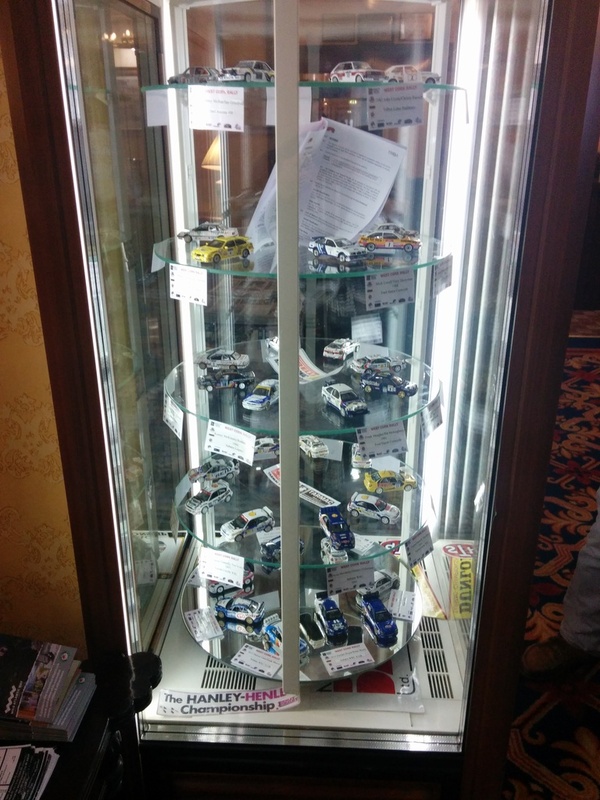 As expected we had a number of competitors showing interest including John Coyne for obvious reasons and a myriad of others bookended by Craig Breen and Vincent Bonnar. James, I must get a look today if I have a few minutes spare and I'll get photos posted! Met Juha in the bar last night! Hello again, good to meet you! Excellent display. Who made the Jennings No4 Impreza? Impressive display, i think i have to visit Clonakilty next year haven't been since 2006. Well done James and Co very impressive. Cess wrote: James, I must get a look today if I have a few minutes spare and I'll get photos posted! Same here! What are the odds of that happening? We'll head back after dinner. Lots of people looking at the the display. Very proud that my Fisher M3 was there. Took a load of pics and will put them up later. A 460 mile round trip in one day is telling a bit now so off to the cot. Thanks guys but credit has to go to the builders. 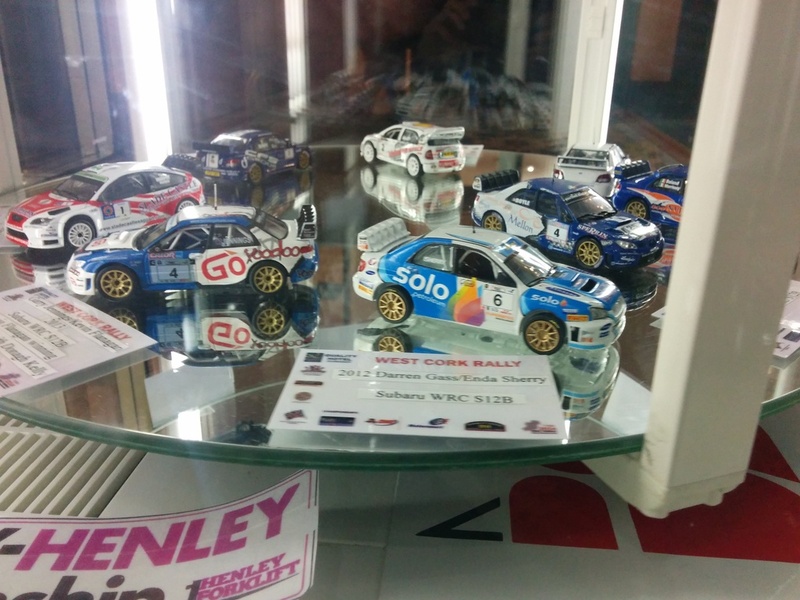 There was no appropriately sized Clonakilty Blackpudding sized sticker so I put in the 2015 Championship regs with the appropriate logos which was a bad call as the damn thing wont stand up - all thats keeping it from falling on the models is the cellotape I used to stick it to the base. Very well done James. It would be great to see individual photos, if that was possible. The 2015 Championship Prizegiving is in the Clayton in Galway in mid October this year......................... could we arrange the display again lads??????????? Regards, Bobby. 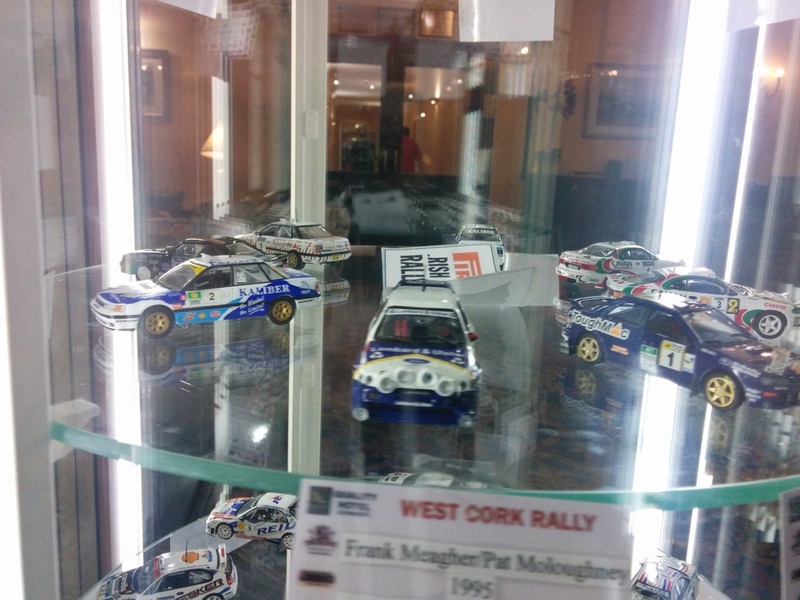 The display caught the eyes of the powers that be so Mick Bracken has it "in the can" so there is a chance that it may appear in some shape in the report of the 2015 West Cork Rally - for those of you familiar with WRC Rally Radio he had Becs with him and she was quite taken by it. Great display from everyone involved. 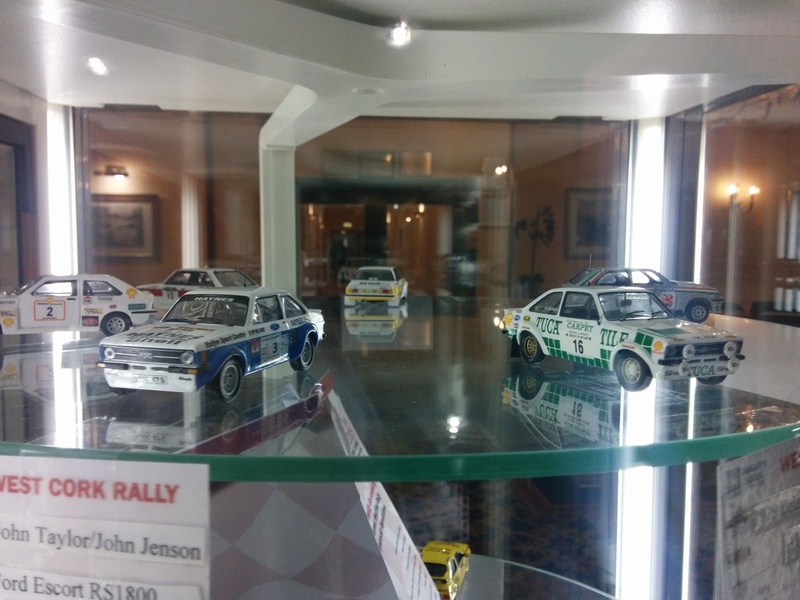 Nice display cabinet I could do with one like that. But a bit heavy to carry around though!!?? 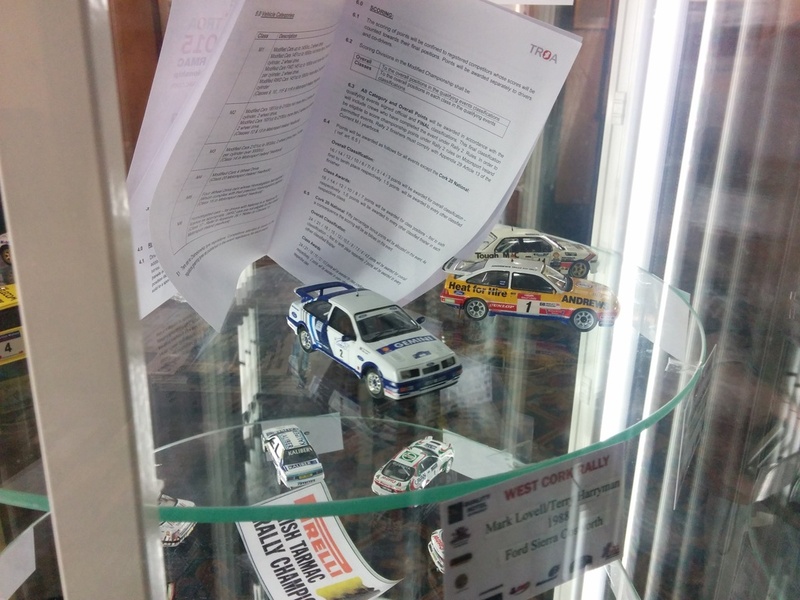 Chris the display cabinet is the property of the Rally HQ - the Hotel could not be more accommodating both to us, to the rally organisers and was mentioned to me by quite a number of competitors as having gone above and beyond the call of duty to help them. We are all quick to complain, myself included, but one should give credit where credit is due and in this case it is well deserved. Brian, touring a collection such as this is asking for trouble - wings, mirrors, mudflaps, aerials not to mention risk of shrinkage and transit damage. I am very grateful to Niall and Donie for their models and to Seamus Counihan who came up trumps at the last minute with the 2012 Boyles model. The JFE parcel only arrived this morning. So right - too many complain about everything in life and hand out little or no praise/thanks when something is actually pretty good. Its amazing what you can do when people are pro active rather than reactive!! We all do it because we want to do it and it is down to enthusiasm, skill, time and effort and all done voluntarily that makes these things happen at all. Doesnt matter how long we have been putting on displays or organising events a nod of recognition or thanks does make it all worth it. Great display, is that a Lovell Sierra in the white & blue? Zeus wrote: Great display, is that a Lovell Sierra in the white & blue? Very cool, are the decals available? We used a partially stripped McRae model so will have to check.